In #Premium competitions, Tournament director (TD) can choose to require players to sign their scores at the end of the round. Signing the score will lock it and only TD or competition officials can update the scores after signing. Clicking "click here" will take user into review / signing page for checking the hole-by-hole scoring and sign it. System will keep track of signed scores by recording who has signed the score and when. Competition officials can also sign scores on behalf of the players. This option can be enabe from competition settings under Edit competition --> Details --> Require players to sign scores = Yes. 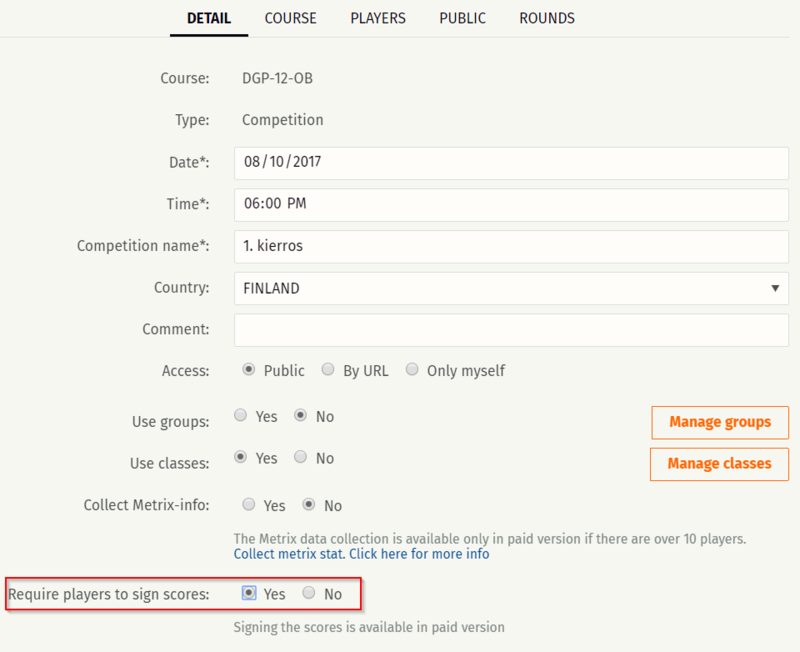 When this option is enabled, then users will be notified on top of the results table when round scores completed for a player. Note! After player signs his/hers score, the player can not update those scores anymore. Only TD or competition officials can update after signing. Competition officials can check unsigned scores from "Check" button on top or by going to "Entering" mode on desktop view. From you TD can check unsigned scores and possible errors with Metrix statistics (like missing putts). Signing scores only available for Premium competitions.